The key to a great paella starts from the backbone of the dish, the soffrito. A soffrito (in Spain) is generally a mixture of onions, garlic and tomatoes that are cooked down and caramelized for hours until you’re left with almost a thick “paste”. This stuff is SO good and really sets a great base flavor for this dish. I generally make more than I need for the dish and use rest for things like, mixing into my morning eggs, spreading onto a piece of toast…or eating it by the spoonful right out of the jar, SO GOOD. This dish is a little time consuming, but really not as intimidating to make as it may seem. Plus it’s always a great crowd pleaser, all the way from the gorgeous presentation to the robust flavors…this dish is a total keeper! We hope you all enjoy this awesome dish!….jeez, could I possibly use the word “dish” more??? 2. Pour oil into a heavy bottom skillet, over medium-low heat. 3. Add all soffrito ingredients into skillet, except tomatoes, and stir. Season with salt and pepper. 4. Allow mixture to caramelize for about 2 1/2 hours, stirring occasionally. 5. Stir in tomatoes and cook down an additional 30 minutes or until the mixture becomes thick. Season with salt and pepper. 6. Remove from heat an allow to cool completely. 7. Pour stock and saffron into a medium saucepan, place over medium heat and bring to a simmer. 8. Poach seafood in the saffron infused stock, one type at a time, until shrimp has just cooked through and the clams and mussels have just opened. Remove from stock and set aside covered. 9. Pour oil into a 14-16” paella pan (or heavy bottom skillet) and place over medium-high heat. 10. Season chicken piece with salt and pepper and sear on each side for about 3 minutes. Remove from heat and set aside. 11. Brown chorizo for about 1 to 2 minutes and remove from pan. Set aside. 12. Drain all but 2 tablespoons grease from pan and add rice, chorizo and 1/4 cup soffrito to pan and season with salt and pepper. Stir together and sauté for about 2 minutes. 13. Pour hot stock over rice mixture and bring to a boil. Once mixture has come to a boil add chicken pieces back into the pan (gently tucking each piece down into the rice mixture). Place paella pan into the oven, covered with foil, and baked for about 10 to 15 minutes. Remove cover and continue to bake for an additional 10 to 15 minutes or until all the liquid has evaporated and the rice has cooked through. 14. 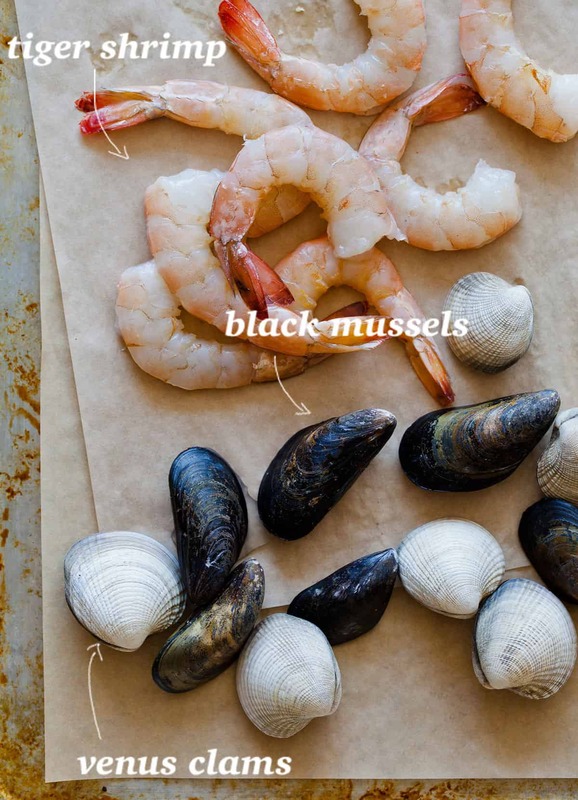 Remove from oven and top with poached seafood (slightly warm seafood, if needed). 15. Finish with a sprinkle of parsley, lemon wedges and sweet peas, if using. Serve. This looks super tasty! Love the plated photo too! I’ll take shrimp and a chicken leg any day. I’ve always wanted to try my hand at paella. Saffron is one of those indulgences that I can’t get enough of – what is it about saffron and lemon together that makes seafood sing!? i’ve never had paella before and would LOVE to try it. sounds so easy and looks amazing! Looks wonderful, and it really resembles the real thing. But being Spanish myself, I have never meet anyone doing a sofrito for 2 and half hours. 20 to 30 minutes should be more than enough, really. We never put chorizo to the paella, either, but I am sure it will give a special flavor to the dish. Really?! I learned this recipe from an old chef instructor of mine, born and raised in Spain, who insists that the soffrito be cooked down SUPER low and slow for maximum flavor and caramelization! Because of that, I get paranoid about the flavor otherwise :)……and yes, Spanish chorizo, not super traditional but something I swear by…so good! I’m afraid, as spanish too, I agree with the previous comment. Sofrito won’t take you more than half an hour ( otherwise onion can burn). Why do you call it caramelised where there’s no caramel or sugar? It’s true paella is really versatile, although I prefer not mixing seafood&vegetables&chicken, but I’ve never seen it with chorizo!! So beautiful! I don’t like seafood, but that looks really really good! I brought the smallest parcel of saffron with me as part of my treasure trove of spices. I have been so scared to use because then it will all be gone! So I need to choose wisely… this could be the one to use it on! Could the be made with a fish. I’m not a big fan of the clams but a chunk of fish sounds wonderful. And what kind of fish would you recommend? I think fish would be great! I would probably recommend a hearty white fish like halibut or tilapia (for a less expensive option)! 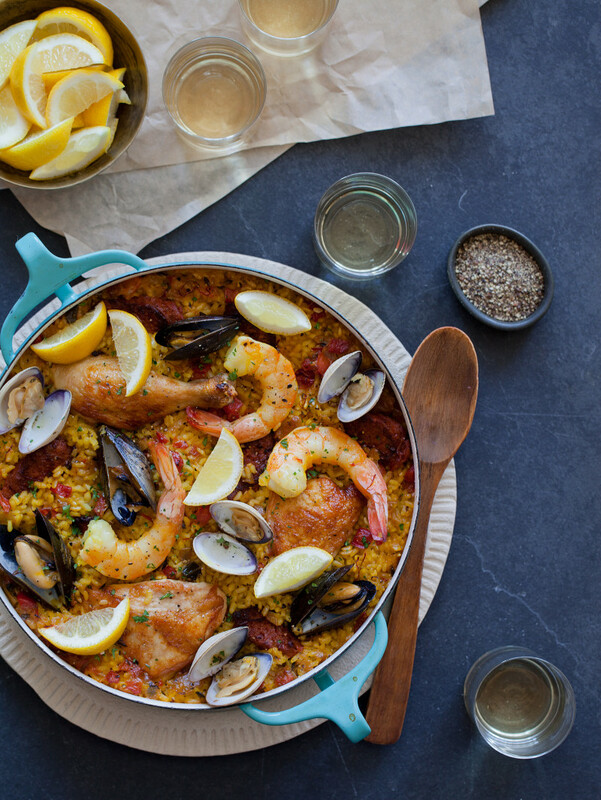 Paella is one of my favourite dishes for o many reasons…this looks like a really great one! This is our recipe so we add and do what we want. If you want a typical recipe then follow your grandmas. your reply to this comment bummed me out. what happened to friendly dialogue? he asked that you not take it as a criticism, but you seem to have done so, to your own detriment. i really like your blog…and paella…and polite discourse. i don’t want to have to give up any of those three things! Hello! I know the reply might seem a bit harsh and frustrating, especially when someone is telling us their honest opinion. What we’d really like for you to understand is that we put our blood, sweat and tears into this blog…which provides free recipes, images and stories from our own kitchens and experiences. I’m actually the recipe developer between the two of us and I write all of the recipes from scratch. I will literally sit in my kitchen for hours upon hours trying to learn how to make something or perfecting one of my recipe because it’s a true passion of mine…and just for the blog and our readers; not just for my clients. I never claim to be presenting completely authentic dishes, just my own recipes, written straight from my brian, through tons of research and trial and error. I love learning, through comments, other variations of dishes we present, but to see people telling me my recipes are wrong is mind boggling and huge bummer to me personally. Teri’s pretty much defending MY work (the recipes) which as a friend and business partner I truly appreciate. Perhaps it could’ve been done in a less snarky manner, but hey that’s Teri and I love her for it. We hope you’ll continue to read and cook alongside us as we really do produce these recipe for our rad and badass readers! i really appreciate the time you took to reply. thanks for explaining – i just wanted to stand up for the paella purist :) it makes sense that teri would want to stand up for you, too. i’m a terrible cook – i read your blog to satiate hunger in my imagination only – so can’t relate to the time and effort it takes to create and perfect a recipe on one’s own. it also makes sense that one would become personally invested in the result! Colorant (like turmeric) would be insulting to this dish…absolutely insulting…the idea of it bums me out. 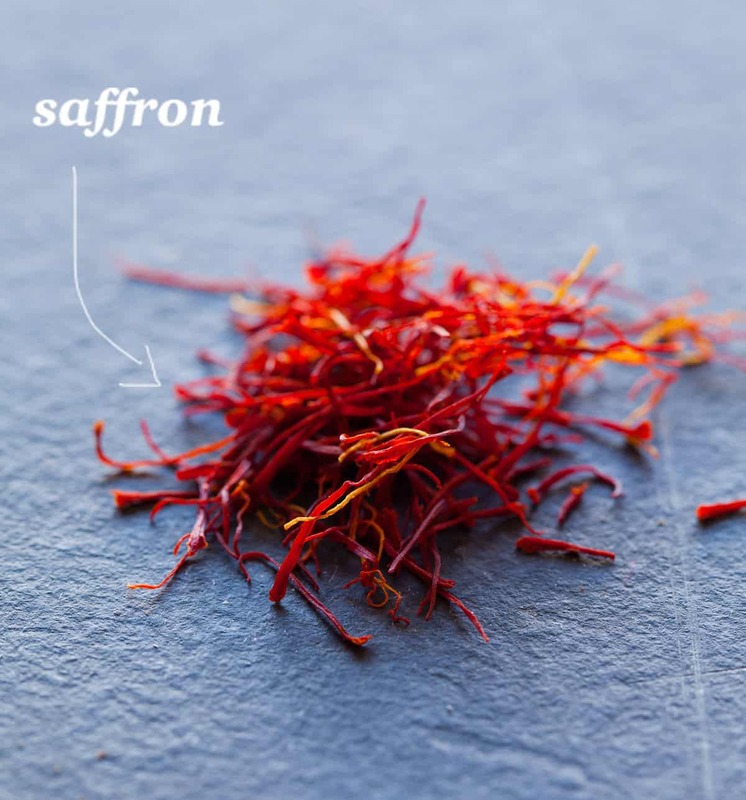 The saffron adds awesome flavor (especially with shellfish!! )…one that “colorants” do not. As is not being open to different interpretations.. This debate will probably keep getting people fired up for hundreds of years to come. The earliest paellas actually contained eel or water vole as the primary protein, but you don’t see anyone getting up in arms insisting we use that today. Bottom line: “traditional” paella is delicious and can never be replaced as a classic. But food evolves constantly and getting upset about it only dooms you to a lot of unnecessary angst. Oh God, now I just kind of NEED this for dinner, like right now! And… re: the comments above, I’m pretty sure I’ve seen chorizo in Paella before. Maybe it’s a SoCal thing? Thank you for this! Really! I learned these techniques from a Spanish chef instructor who insisted that he grew up eating Paella in Spain this way. I’ve of course added my own ingredients…i.e. the chorizo (which I actually experienced in Catalan, Spain while eating Paella!! ), poblano to my soffrito, etc etc, but that’s exactly why this is MY recipe and I think people seem to forget that. I’m not Spanish, nor have I ever lived there; I’ve only had the pleasure of experiencing a short trip to Spain and would love to return one day and explore the country. I’m a Korean-American girl from Chicago, now living in LA….give me a break people! :) haha! either way, thank you for your kind words! A blogger friend recommended your blog to me and here I am, enjoying every post I read and every picture I see. It is wonderful. I stop here to leave my comment cause, being Spanish, I feel it is here where I should write. No time for more. Believe me if I say I would comment on every single entry cause they all deserve it. Paella is a very versatile dish and each region within Spain, home, etc makes its own. There are tons of variations to the real thing, if there is such a thing. Some use only seafood, others only meat, others just vegetables (try this one…it is yummy), etc. Yours looks fab and I am sure tasted just as good. Keep the good work going !!! Love this post – so much so that I’m featuring it in this week’s Food Fetish Friday series (with a link-back and attribution). I hope you have no objections and I’m always inspired by your creations… Thanks so much for sharing. Hi Teri and Jenny. I love this blog and am so excited to find this recipe. I lived in Spain for 6 months and really miss the paella. I have made it at home before and have gotten pretty good at it but am always looking for new ideas to make it even better. And personally I add lots of chorizo and LOVE the flavor it adds. I have never cooked the sofrito that long but I will try it next time. 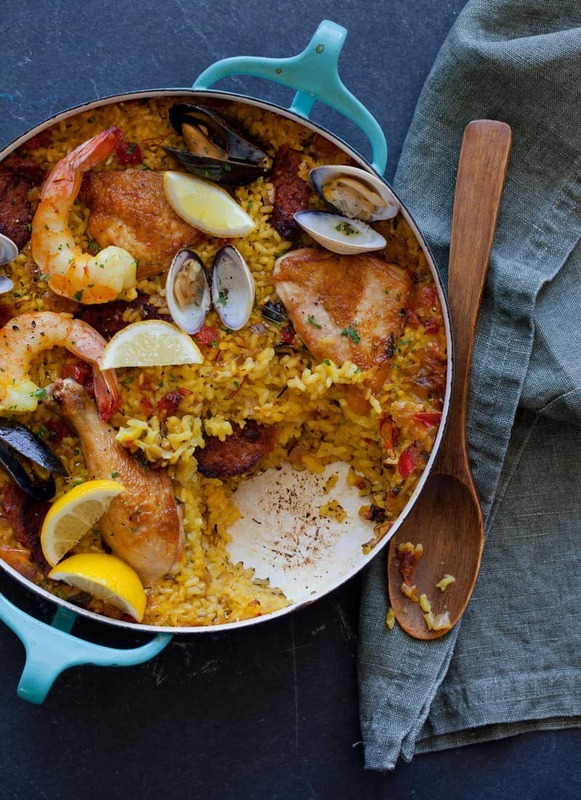 One quick question – it is my understanding that paella is originally the name of the large pan the dish is cooked and served in and that it is important to cook everything in that same pan to keep all the flavors in. It seems like you are using different pans for the sofrito and meat/seafood versus the actual paella. Is there a specific reason for one way or another? PS – I love the idea of baking the paella. If you want the crunchy rice on the bottom (the soccarat) and don’t get that from the oven try putting it on the stove for a few minutes at the end. The toasted rice on the bottom is my favorite part!! The confusion is totally my fault! I did cook the soffrito and meats in the the paella pan and should’ve specified that! I poached the seafood in the saffron stock separately before adding it to the paella because I like the extra saffron flavor infused into the shellfish…plus it dyes them a pretty light yellow! Thanks for the rec for the crunchy rice….the soccarat really is the best part! Just wanted to let you know I made the paella this weekend and it turned out AWESOME. I cooked the soffrito for 3 hours total like you said and it is just so tasty (and I have a bunch leftover!). I loved cooking the paella in the oven – it cooked much more evenly than when I do it on the stove. I did add a few minutes on the stovetop to brown the bottom of the rice and it was just so good. Thanks for the recipe! Yay! This is one of my favorites so I’m so happy you like it! Great idea to use the stove at the end…the crispy bottom really is one of the best parts! Your site brings my joy every dull day in my office. I have a professed love affair with Spanish cuisine and tried to make paella last year, although good, yours looks divine! I want to thank you for sharing this recipe as well as the beautiful images. Where did you get that paella pan? It is so rad! Hi!! I’m also Spanish and i think i have something to add…… my grandma always put chorizo in her Paella!!! Every family/cooker/restaurant has its own recipe, and thats one of the best things about this very tradicional spanish dish!! I simply want to say I’m very new to blogs and truly enjoyed this website. Likely I’m want to bookmark your website . You actually come with beneficial articles. Regards for sharing your webpage. What do you use to draw the arrows and write the texts on your photos? This look ABSOLUTELY amazing. Thank you so much for sharing. I love your website! Well I am very proud of myself because I actually made this dish for an early Father’s Day dinner the other night. While it was labor intensive (I opted to make the soffrito the night before so I wasn’t too rushed or standing over the oven for hours and hours) it came out really well and I’m happy to have tackled this recipe! I had taken a paella making course in Barcelona years ago but all I remembered was taking a turn stirring the pot (maybe not the most advanced course) so I can’t weigh in over the soffrito-making drama in the comments except to say that telling someone they’re making a dish wrong is kind of like telling someone that their painting isn’t how it’s supposed to look. Creative freedom, man! Anyway, the soffrito is delicious and the paella blew everyone away. Keep the recipes comin’ (you’re making me look good)!!! I had some down time during the kids’ nap today, so I decided to go through recently pinned recipes and found this one! My husband made us some bloody mary’s and we sat down on the sofa to ‘hang.’ Backstory:: We went to Barcleona for our honeymoon nearly 8 years ago, so we’ve always got our eyes peeled for a bang up Paella recipe, as we’ve experienced the original but never attempted to make it at home… Anyways, I read this entire recipe to him aloud, and we want to try it and have some friends over for either my birthday or our anniversary this year. Thank you for posting this beautiful (really love your photos!!) and seemingly attainable authentic version of Paella! We are so excited, as we have been intimidated to make Paella thus far, but are eager to try! Yay! Please let us know how it goes!!! Your recipe sounds fab!! I am having a bunch of friends over this weekend and making my first ever paella. I have been pouring over paella recipes online for the last two weeks. Quite a lot of variation, but spanish chorizo certainly makes an appearance in at least 75% of them! I love your method for the soffrito – not sure if I will have time for the whole 3 hours, but will give it a shot. I also love your idea of poaching the seafood in the saffron broth! I haven’t seen that one anywhere, and kept trying to think how I could impart more flavor into the seafoods and meat. Excellent idea! One question- I love the smokey flavor from cooking the paella over an open fire, but don’t want to spend the whole party fussing with keeping the flame at a constant temp, etc. Thinking about doing everything a couple hours in advance, except the last 10-15 minutes. Thinking about fully cooking the chicken (rubbed with paprika, s/p) on a smoker, to get a nice smokey flavor; then assembling the entire dish (putting the meat and seafood on top of the almost done rice) and putting the whole thing in the smoker to finish up and get a bit of real smokey flavor. Would this be a good idea, or do you think a mild smoking wood would overwhelm the flavors of the paprika and saffron? I think the overall smoking in the end, might end up being a bit much…BUT I LOVE your idea of smoking the chicken beforehand. Good luck and enjoy! Great – thanks for the advice! How many grams of rice do I use?! About 420g of short grain rice! Hi! 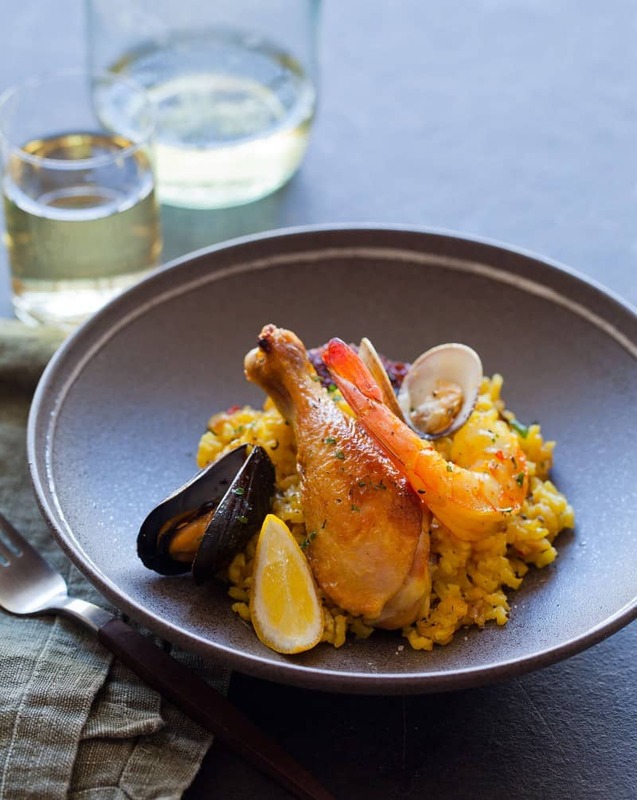 I’m new to your blog and happened to chance upon it while looking for a recipe for paella. I was gifted with a paellera sometime time ago and have yet to use it. I was planning on trying your method and recipe since your paella looks so darn good in the photo! :) Before I try your recipe, I have one quick question. Did you use all 5 cups of stock to cook the 2 cups of rice? Thanks in advance and hope to hear from you soon! Yes! By the time the seafood has poached you’ll have lost a little bit of the overall stock yield. Good luck using your paella pan, how fun! Hello, can you clarify which are the soffito ingredients? Is it the first 7 ingredients? Thank you!! This recipe was amazing! There’s so much flavor in all the components in this dish. I made the soffrito the day before to break up the amount of work that’s involved. Just made this today and it was GORGEOUS! Thank you so much for the recipe. PINGBACK: Ouimove – 10 great ideas for Summer in Ibiza!